PHILADELPHIA (Legal Newsline) – In arguing that taxi monopolies in urban areas are facing their first competition in years, ride-sharing service Uber has positioned itself as a force of innovation against a backward-looking transportation sector that’s resisting change, according to an attorney and law professor who has authored numerous articles on law and technology. John Browning, an attorney with Passman & Jones in Dallas, said the position Uber makes in response to a March 15 antitrust lawsuit filed by Philadelphia Taxi Association portrays the taxi companies’ line of reasoning as little more than sour grapes after failing to keep up with the pace of technology. “That is probably the best argument it could make,” Browning said. In the Philadelphia lawsuit, the taxi association accuses Uber of evading the city’s system of licensing taxi cabs and authorizing their operations. Under Uber’s business plan, the company contracts with drivers using their own vehicles to provide ride-sharing services with the help of specialized apps to link customers and drivers. 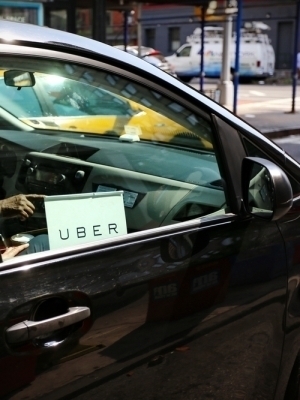 The lawsuit also accuses Uber of predatory business practices by luring drivers to work for the company, as well as operating a monopoly and violating both the Sherman Antitrust Act and the Clayton Antitrust Act. Browning said the argument that Uber is not following municipal licensing systems has been raised in other cities and is currently working its way through the courts. The debate is also intertwined with rules on full-time hourly employees vs. contract workers. Despite all the litigation, at some airports as much as half of the passenger traffic is going to ride-sharing companies such as Uber and Lyft, cutting significantly into the taxi business, he said. In addition, Browning said, “Uber has faced some fairly harsh questioning and criticism about whether it is doing sufficient background checks,” noting that there have been some high-profile cases about the company’s problem drivers. He also said that the argument in the lawsuit that Uber is violating antitrust legislation is novel. He expressed some doubt that the antitrust argument might be applicable in this case, since app-driven ride-sharing companies are a relatively new phenomenon. Browning said that the argument might have more traction if, for example, Uber and Lyft were to merge into one, creating a company that dominated the ride-sharing market. Browning also is not convinced that the Philadelphia Taxi Association would be successful in its allegation that Uber is engaging in predatory practices simply by offering monetary incentives for taxi drivers to work for Uber. “I’m not sure that the taxi side of the argument is the right side of the argument,” he said, adding that offering incentives may not constitute proof of playing unfairly. Browning said that on many technological issues, the law has not been able to catch up with technological innovations. And many new laws that have been written to deal with technology and privacy issues have been struck down. “The law has not kept pace with technology, and I don’t think it ever will,” he said. Once a business is no longer regarded as a fad and begins to make inroads in the marketplace, the success is bound to attract legal actions, Browning said.